As Americans get heavier they are, literally, crushing their feet. Think of it: Your feet are responsible for carrying your whole entire body around. Excess weight, however, changes the way the foot functions. Carrying extra body weight greatly increases pressure on the bottom of the feet, flattens the feet, shortens your gait and can lead to your feet angling out more. Since extra weight can stretch out the connective tissues holding bones together, your feet may well widen somewhat with time. Did you know that when climbing up stairs or walking on an incline, we carry approximately four to six times our body weight across the ankle joint? Extra body weight significantly increases the impact. You need your feet to keep you mobile. 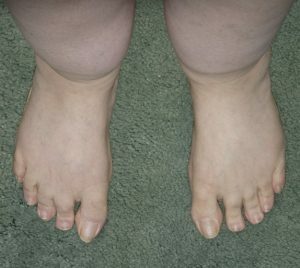 The problems of obesity and your feet can cause distress and pain that limit your mobility and quality of life. Extra weight can damage the joints of the foot and ankle, and foot and ankle pain can lead to further weight gain because it makes exercise more difficult. Since walking, and even standing, often becomes painful and unpleasant, someone who is overweight is less likely to exercise so they can avoid the discomfort. This, in turn, makes them more likely to gain additional weight, compounding the pain and becoming a negative cycle of discomfort.
. . . and then of course is the issue of Gout, which develops when crystals of a substance called uric acid accumulate in your joints. This condition is known for causing very sharp, severe pain, typically in the big toe, but it can also affect other joints in your feet and ankles. Being overweight makes you more likely to develop gout by increasing the production of uric acid in your body. For those who are overweight or obese and who suffer with weight-bearing feet and ankle issues, diabetic-related feet issues, as well as obesity-induced problems in the tendons and ligaments, losing weight is a critical aspect of treating many foot problems.